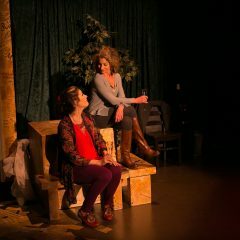 OUT FROM UNDER WITH MARY, Women's Shorts, Out of Box Theatre, Marietta, GA, April 5th through April 13th, 2019. KID STUFF, 10 X 10 New Play Festival, Barrington Stage Company, Pittsfield, MA, February 14th through March 10th, 2019. Arielle Hurst, Michael Rodriguez and Trejon Dunkley. Arts Center's Drama Studio, Mesa, AZ, December 7th through the 9th, 2018. Rowland directed actors Elli Bezotte, Michael Fish and Jill Watterson. BANKIN' ON THE GRAND, Reading, Magnolia Arts Center, Greenville, NC, July 13th, 2018. 19th, 2018. Eric Fritzius directed actors Rhonda Pritt and Bill W. Mitchell. through the 20th, 2018. 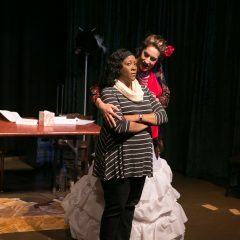 Heath Sartorius directed actors Anna Szabo and Sadonna Croff. 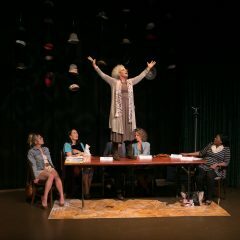 PEOPLE LIKE US, Short Attention Span Theater at the Acorn Theater, Three Oaks, MI, May 5th, 2018. Jane Brody directed. 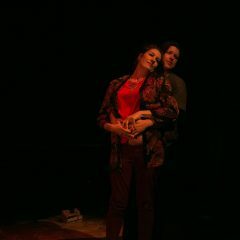 OUT FROM UNDER WITH MARY, Allen Bales Theatre, University of Alabama, Tascaloosa, AL, May 1, 2018. Joseph Arrigo directed actors Katharina Fox and Sarah Grace Valleroy. stage directions read by Lauren Tothero. BUNKER BOUND, The Phoenix Theatre New American Theatre Festival, Hormel Theatre, Phoenix, AZ, March 22, 2018. GETTING LUCKY, part of "Love and Other Calamities," Staged Right Theatre, Lilburn, GA, March 2nd and 3rd, 2018. 12th through the 20th, 2018. Coffeehouse Cafe, Orange Park, FL, on June 23, 2017, at 7 PM. Gallery at the Vern Riffe Center, Downtown Columbus, Ohio. 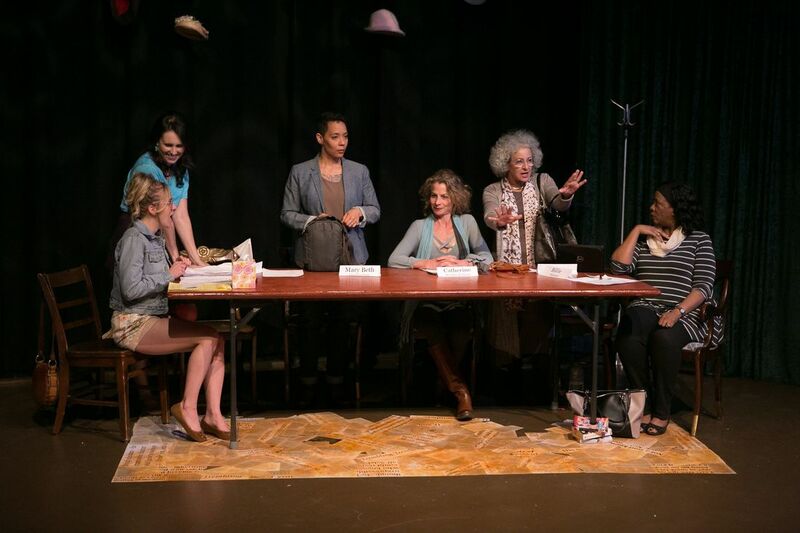 OUT FROM UNDER WITH MARY, Spring Shorts, Onstage Atlanta, Decatur, GA, May 5th through the 14th, 2017. De Pree directed. Photos below by Brian Kwan. SVA Theatre in NYC on March 20th, 2017. Holli Harms, Chair. KID STUFF, Storefront Theatre's Readers' Theatre Play Festival, Waxhaw, NC, March 4th and 5th, 2017. Works 2016 Festival, Renaissance Theatre, Huntington, WV, on Friday, December 2nd, 2016, at 7:30 PM. WEIGHT, a new one-act play, was "read" as part of the 12th Annual Reader's Theatre Matinee at Southwest Theatre, Houston, TX, on Sunday, November 20th, 2016, at 3 PM. Brian Heaton and Scott McWhirter, Producers. 2016, at 2 PM. Alice Stanley directed. ​ Theatre October 1st and 2nd, 2016, at the Public House Theatre in Chicago, IL. Chris Thoren directed. the 24th, 2016. Ian Bowater directed actors Johanna Burwell, Mary Rowland, and Sean McCracken. The play was one of ten chosen from more than one thousand submissions. OUT FROM UNDER WITH MARY, Skippack Playcrafters Fringe Fest, Skippack, PA, July 1st through the 3rd, 2016. LEGACY, Pocahontas County Opera House Playfest, Martinton, WV, May 19th through the 21st, 2016. Eric Fritzius directed. NYC, May 11th, 2016, 7 PM. Valerie Adami directed. Millibo Art Theatre in Colorado Springs. Crystal Carter directed. OUT FROM UNDER WITH MARY placed 5th in the 24th Annual Nantucket Short Play Competition. DIRE DAY SEVEN, a new play, was part of Women in Theatre's Kauai Shorts Festival at the Kauai Community College Performing Arts Center, Kauai, Hawaii, August 7th & 8th, 2015. 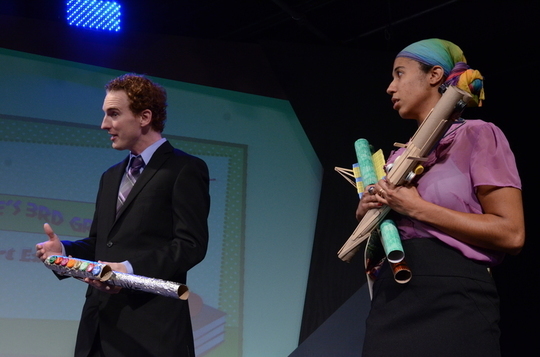 FAMILY BAGGAGE, The 18th Festival of Originals, Theatre Southwest, Houston, TX, July 24th through August 8th, 2015. Justin Holloway directed. WAITING FOR HEATHER, co-written with John L. Martin, "Seattle After Hours," Seattle Theatre Works, The Erickson Theatre, July 10th through the 25th, 2015. 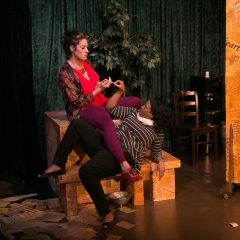 THE THING ABOUT ELLA, Indie Boots Theatre Festival 2015, The Side Project Theatre, Chicago, IL, April 27th through April 29th, 2015. Richard Paro directed. Featuring actors Laura Elleseg and Mackenzie Wiglesworth. PEOPLE LIKE US, Boiling Point Players' "Get Lucky" Cabaret at Rudyard's British Pub, Houston, TX, March 19th, 2015. Featuring actors Leslie Sharp and Katy Burns. Ruth McCleskey directed. PEOPLE LIKE US, "Claiming the Space: A Play Fest," The Actors Studio of Newburyport in Newburyport, MA, March 13th through the 22nd, 2015. 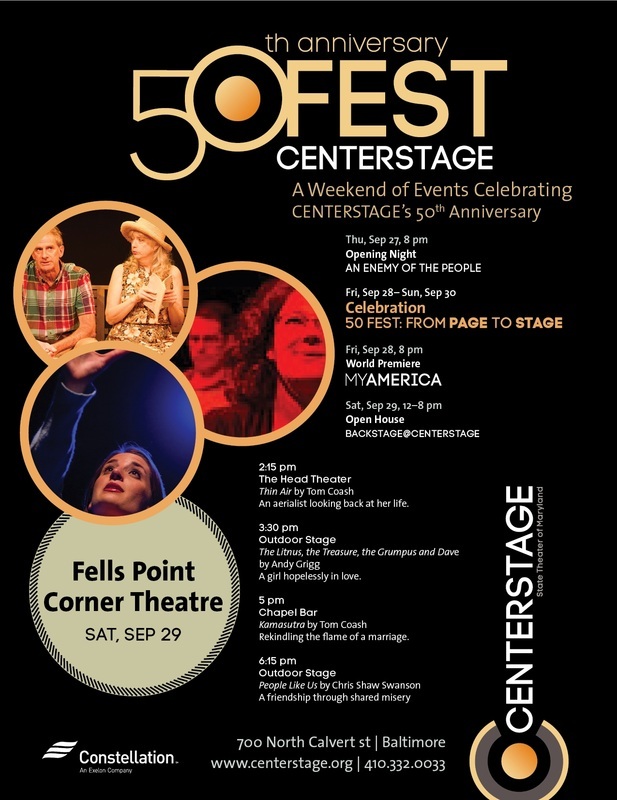 Featuring actors Lisa Joyce and Paige Fasold. Jenney Dale Holland directed. TAKE TWO has advanced to the Short & Sweet Festival's Wildcards Finals on March 7th and 8th at the Factory Theatre in Sydney, Australia. With over 1,000 submissions to Short & Sweet and around 160 plays included in the Festival, the Wildcard Finals is one of three showcases featuring the top plays chosen by the judges and/or audience vote during the Festival's eight-week run. Way to go Laura Goddard, Jonathon Emmett and Marcelle Wever! ​ special thanks to Sarah Lake-Rayburn and Ben Ganger for their insightful reading. Marcelle for ranking 2nd in the Audience Vote! MAXED OUT AT CHRISTMAS, Hard Candy Christmas Play Festival, The Charles Stewart Howard Playhouse, Woodland Hills, CA, December 6th through the 14th, 2014. OUT FROM UNDER WITH MARY, SLAM Boston, Open Theatre Project, Boston Playwrights' Theatre, Boston, MA, December 2nd through 4th, 2014. Congrats to director Stephanie LeBolt and actors Lynn Wilcott and Ceit McCaleb Zweil for making it to the final round! October 5th, 2014. Featuring actors Jessica Davies and Jayson Morrison. Maeve MacGregor directed. ​ Prentice. Directed by Angel Reyes, Jr.
BANKIN' ON THE GRAND, Short + Sweet Festival in Auckland, New Zealand, August 26th through the 30th, 2014. Featuring actors Dawn Glover and Raj Singh. Dennis Brooks directed. by audience vote. Congrats to Srikanth, Smrithi and Charan! ​ Christine Boos, and Ben Menning! LOST IN THE QUAGMIRE, Write Now 5 Shorts, Jack Studio Theatre, London, England, May 17th, 2014. This is Chris' U.K. THE MEMORY BOX, Kent Denver Players, Kent Denver School, Englewood, CO, May 2, 2014. April 27th, 2014. Birgitta DePree directed. 2013: THE BEST TEN-MINUTE PLAYS. MEASURED HONESTY, NOTEwood series of staged readings, Theatre of NOTE, Los Angeles, CA, March 5th, 2014. ​ February 27th through March 1st, 2014. Elaine Hardwick directed. ​ Lionheart Theatre in Norcross February 14th through the 16th. Hilary King directed. STICKER SHOCK, 2nd Annual Piney Fork Theater Playwriting Festival, New York Public Library Riverside Branch/Lincoln Center, NYC, February 8th, 2014. Monologue performed by Melissa Jane Martin and directed by Jeff Stone. Theater Company, Houston, TX, December 2013. Michelle Edwards directed. OUT FROM UNDER WITH MARY, "Shorts in a Bundle" at Fells Point Corner Theatre, Baltimore, MD, October 18th through November 3, 2013. Richard Barber directed. LEGACY, ACT ONE: One Act Play Festival, Secret Theatre, Queens, NY, September 5th through September 15th, 2013. Tyrus Cukavac directed. PICTURING MARE, The New American Theatre's Festival of New One Act Plays 2013, The Odyssey Theatre, Los Angeles, June 16 & 20, 2013. Jack Stehlin directed. LOST IN THE QUAGMIRE debuts at Subversive Shorts 2013, Subversive Theatre Collective, The Manny Fried Playhouse, Buffalo, NY, June 14th through July 7th, 2013. Bob Van Valin directed. OUT FROM UNDER WITH MARY, Short & Sweet Festival, Herald Theatre, Auckland, New Zealand, June 2013. Terry Hooper directed. This was Chris' New Zealand debut. 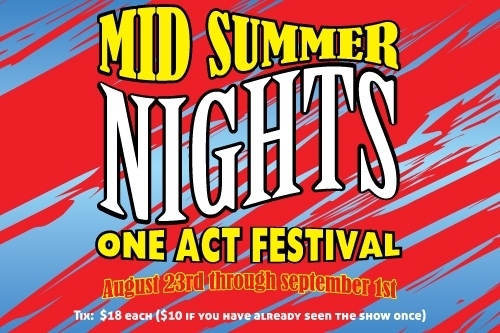 part of Lourdes University's Festival of One Acts, Sylvania, OH. Danita Binkowski directed. QUALITY TIME debuts at the Short & Sweet Festival, Sydney, Australia, March, 2013. Jasna Krsmanovic directed. 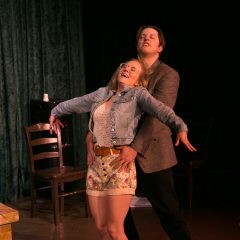 GETTING LUCKY, 10 X 10 at Fells Point Corner Theatre, Baltimore, MD, April 12th through May 5th, 2013. Lance Lewman directed. 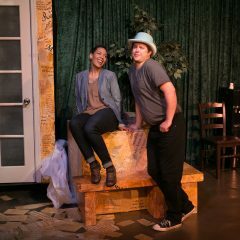 OUT FROM UNDER WITH MARY, Pick of the Vine: Season 10 at Little Fish Theatre, San Pedro, CA, 1/12--2/12. 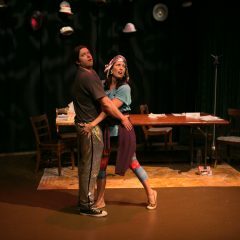 PEOPLE LIKE US, 10 X 10 at Fells Point Corner Theatre, Baltimore, MD, 4/12. 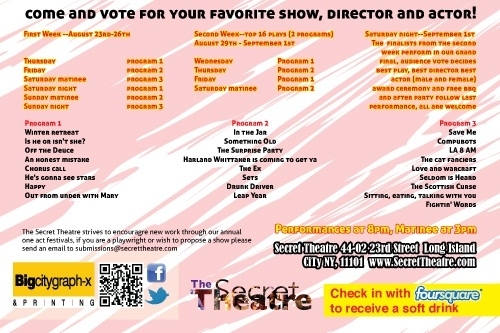 THE MEMORY BOX, the 7th Annual One-Act Play Festival, The Black Box Theatre, Cranston, RI, 7/12. OUT FROM UNDER WITH MARY, Midsummer Nights One Act Festival, Secret Theatre, NYC, 8/23 through 8/26/12. OUT FROM UNDER... advances to the Midsummer Nights competition finals, extending its run through 9/01/12. Congratulations to Director Odalis Hernandez and Actors Knilo Solei and Marchelle Thurman! Sophie Hinderberger on September 29, 2012, at 6:15 PM on the Street Festival Stage in Baltimore. DROP 'TIL YOU SHOP at North Park Playwright Festival. L to R: Lee Howeth, Carm Greco. Terry Ghianni, Director. on the campus of Lourdes University in Sylvania, Ohio. She is the guest of the Lourdes Drama Society.